I am beginning work with a new client, and they are using HubSpot. 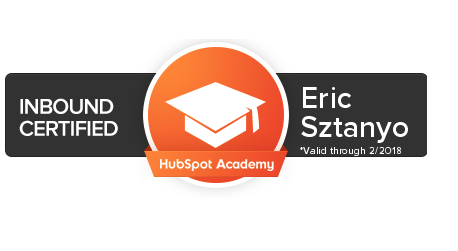 I’ve heard good things about HubSpot but haven’t had a chance to use it yet. I’m excited at the opportunity as it looks like a neat system to do a great job of connecting marketing efforts with the sales team. As I began reviewing the tool, I decided to head over to their Academy. Looks like they’ve done a really neat job at creating a place where marketers can learn some great skills and tools. All of the subject material seemed like review to me, so I decided to jump straight to the test. As it turns out, it was the right move. I passed with flying colors and am now Inbound certified! Woo hoo, a badge! Yes, I will share you socially, thank you very much. It’s been a while (probably 2003 in college) since I’ve taken a test and received that satisfying feeling of a good grade.